On arrival at the Cochin Airport/Railway Station, our tour representative helps you with an assisted transfer to your hotel. Also known as the ‘Queen of the Arabian Sea’, Cochin or Kochi is one of the most famous cities of Kerala state. The city is dotted with several popular tourist attractions. As you reach the hotel, complete the check-in formalities. Now, you can relax for some time. In the evening, you can visit the local market where you can get your hands on some excellent spices, handicraft items and nuts. On day 2, after breakfast, you partake in sightseeing, visiting the popular tourist attractions of Cochin. Notice that most of the city’s attractions hold a Portuguese, Dutch and British touch in their architecture. The first visit of the day is to the Jewish Synagogue which was erected way back in the year 1568. The walls of the synagogue have been adorned beautifully hand -painted Chinese tiles in white and blue colors. Next, visit the oldest European church in India, the St. Francis Church. Visit to the church is followed by a visit to the Dutch Palace, also known as the Mattancherry Palace. This palace is known for its attractive murals, Palanquins and other ancient possessions. Thereafter, get all set to visit one of the most popular attractions of Cochin, the Chinese fishing nets. The evening is scheduled for enjoying a Kathakali performance. On this day, go onboard a bus to proceed to your next destination, Munnar, fondly known as the ‘Switzerland of India’. Upon arrival, check into the hotel. Probably, the most popular hill station of Kerala, Munnar is known to be blessed with abundant scenic beauty. The day is scheduled for a wildlife safari at the Eravikulam National Park, home to a rare species of a kind of mountain goat, Nilgiri Tahr. Embark on a jungle safari inside the national park. Once back to the hill town, explore the old town market. After breakfast on the 4th day of tour, have an early morning safari inside the Eravikulam National Park where you can spot several exotic animal species such as Tiger, Leopard, Nilgiri Tahr, Indian bison and more. This national park is also known for owing a rich biodiversity with high elevation shoal-grassland ecosystem. Enjoy the wonderful weather and treat your eyes to the lovely lush views. Today leave your beds early for an early morning leisure nature walk in the verdant tea estates of Munnar where you can also spot Neela Kurunji, a rare floral species found in the region. Back to the hotel and pack your belongings as now you leave by road for Thekaddy to go the extremely popular Periyar National Park, known for housing a decent population of elephant and tigers. As you reach Pariyar, check-in at a jungle resort. The evening is fixed for a bird watching tour while you enjoy boating in the placid waters of the vast Periyar Lake. You would be able to spot several colorful species of resident as well as migratory birds. Overnight stay in the jungle lodge. On day 6, hit the road to the mesmerizing Kumarakom, lying on the banks of Lake Vembanad. 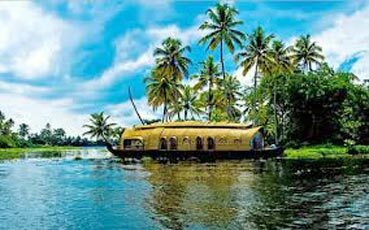 This beautiful town is a popular destination of Kerala, flocked by tourists all year round. On reaching, you complete the check-in formalities at a hotel/resort along the banks of the placid lake. Check-in is followed by lunch. Thereafter, spend the afternoon in enjoying the sights around the Lake. Hop into a boat and spot several colorful avifauna species. In the evening, embark on a leisure walk to explore the serene town or you can also visit the local market to get your hands on some wonderful handicrafts. In the morning, you arrive at the beautiful Alleppey backwater. From here, de-board the houseboat. Later on, get transferred to the Cochin airport to board the flight to your onward destination.